Eric Thames‘ powerful exploits against the Cincinnati Reds last year were well-chronicled. The Milwaukee Brewers first baseman hit .351 against the Reds with 10 home runs and 17 RBI and has hit two more out of the park against Cincinnati this year. While the Reds likely don’t wish to see Thames in the lineup at Great American Ball Park, where he hit five of those home runs in nine games in 2017, the real Cincinnati killer might just be a different member of the Brewers. Since 2015, few players have knocked around Reds pitchers like Milwaukee outfielder Ryan Braun. In that span he has 67 hits, including 17 home runs — no player in the major leagues has more against Cincinnati since 2015. 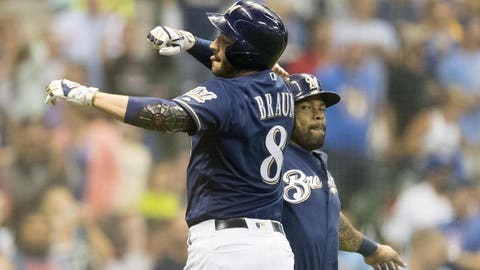 Braun also has the most stolen bases (17) vs. the Reds over that time period, is second in extra-base hits (33, one behind St. Louis’ Matt Carpenter) and fourth in RBI (39). In his career, Braun has played 160 games against Cincinnati (with 156 starts) with a slash line of .281/.354/.543 along with 41 home runs — his most against any team — 97 RBI and 25 steals. In games played at GABP, Braun has socked 25 home runs, which is 10 more than he’s hit in any other road stadium. — Milwaukee is 18-11 in one-run games, the third-best record in the National League. Cincinnati is an NL-worst 6-14. — Scooter Gennett has done well since leaving the Brewers and joining the Reds. But he hasn’t hit well against his former team. Gennett’s .217 batitng average, .280 on-base percentage and .348 slugging percentage are his worst against any team. — Milwaukee starter Junior Guerra has a 2.08 ERA and .191 OBA against NL Central teams in seven starts this season. — Jesus Aguilar has nine home runs in June. That’s the most homers in the month since Prince Fielder hit 10 in 2011. Jeromy Burnitz (1999) and Greg Vaughn (1996) hold the club record with 12 June HRs.